One System of a car that is often overlooked is the vehicle’s transmission. Necessary to the smooth operation of the car and expensive to replace, the transmission is too often forgotten about until it is too late. Many drivers do not know that it is recommended that your transmission be serviced about once every 50,000 miles. Once again your friends in the heart of Phoenix AZ at Auto Repair can handle all your transmission needs. As we all know, knowledge is power so we have compiled a short list of the major parts of a transmission and how they work. Gears: Even if you are driving an automatic transmission, the gears inside your transmission are shifting on a regular basis. These are broken into two groups, the Main and Planetary gears. Both of these are necessary to drive. Fluid: Both manual and automatic transmissions need fluid to operate smoothly, without the fluid your entire transmission will literally come to a grinding halt. Filter: The transmission filter is in place to keep your transmission fluid clean and ensure the smooth shifting of your gears. Bell Housing: Bell housings exist to protect the internal components inside it, namely a flywheel and torque converter. The bell housing is bolted directly on the engine block, depending on whether your vehicle is a front wheel, rear wheel or 4 wheels driven, it could be in a variety of places on the car. Because your vehicle’s transmission can be one of the most costly systems to repair or replace, we at Auto Repair urge you not to allow this system to degrade. Regular maintenance of your transmission will extend its life by leaps and bounds and save you tons of cash in the process. If your transmission is acting up, one thing you can do to troubleshoot is to check the fluid levels. Be sure to check the levels multiple times as one check may not be totally accurate. If your fluid levels are lower than they should be, you may have a slow leak. A slow leak can be especially detrimental to your transmission because it will drop the fluid levels to a point where it causes excessive wear. But a faster leak will get your attention and force you to deal with the problem immediately. Fluid Levels – The level of your transmission fluid is crucial to the transmissions life. It is the coolant, the hydraulic fluid, and the lubricant. It also should be free of particles, clear in color, and odorless. Road Test – During the road test of your automobile we’ll check for shifting sequences, variations in operating ranges for gear selections, slipping, etc. You may accompany our driver/technician and he will explain what is happening. Engine Operation – We’ll check for possible problems that would appear to be transmission related. If your engine is not functioning properly, it will have a definite effect on the efficiency of your transmission. We will diagnose the problem regardless of whether it is the transmission or the engine. Axles, CV Joints, Boots, etc – A failing universal sounds bad and shakes the car. It’s a minor part and replaced easily. CV joints and boots will do the same, although a little more costly to replace. Transmission and Engine Mounts – A bad mount will cause the engine and transmission to move under power and change the shifting sequences of your transmission. Leaks and Seeps – A bad seal or loose connections could cause loss of fluid significant enough to drop levels to a point where operation is effected, normally a simple repair. Drive Shaft and Undercarriage – Moving parts that could cause a problem that might sound or act like a transmission related difficulty when actually it’s really something else. Check Transmission Linkages – Worn and damaged parts cause erratic behavior in shifting and also computer and sequence processing. Cooling System Operation – Your automobile’s cooling system keeps the temperature of your engine within normal operating range. What you don’t see on your instrument panel is the operating temperature of your transmission. Overheating is a certain death to a transmission. We’ll also check all other peripheral areas for leaks including brake cylinders, power steering, etc. 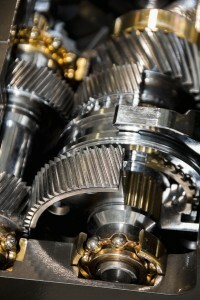 Differential Operation – We’ll check for leaks and evidence of bearing or gear noise. Transmission Pan – We’ll drop the transmission pan to check for excessive metal in the pan or in the filter. Obvious broken metal parts in the pan are indicative of the need for further exploration into the internal parts of the transmission. These large metal parts are from some hard part within the transmission that has failed and will continue to get worse, causing even more interior damage and greater cost to you for repairs.